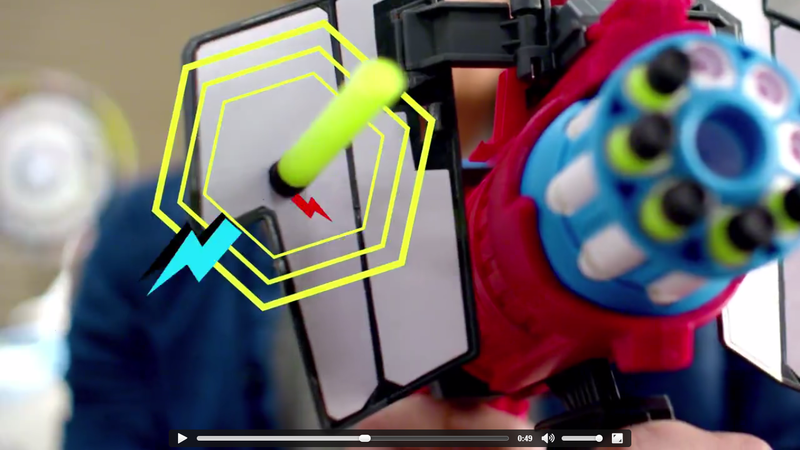 Nerf = Fun. Yep, that's about it. Now that we've spread news about Mattel's BOOMco. blaster line across the NIC, I'm spending this morning evaluating the various promotional videos to find as much information as possible. 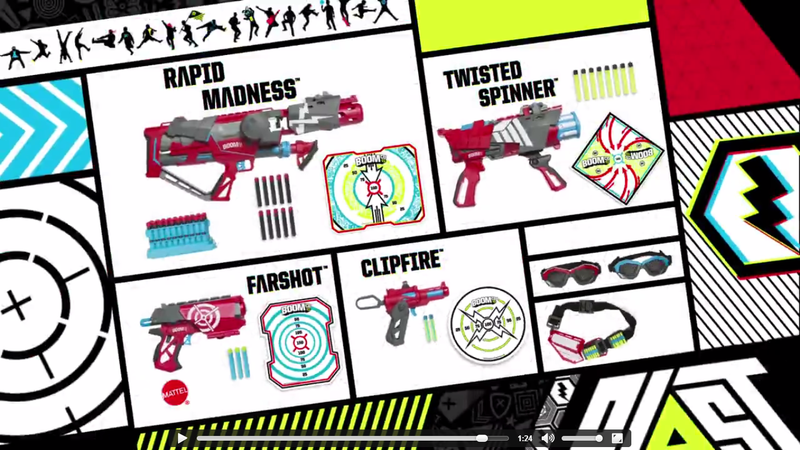 Showing off the blasters, targets, accessories, and more! 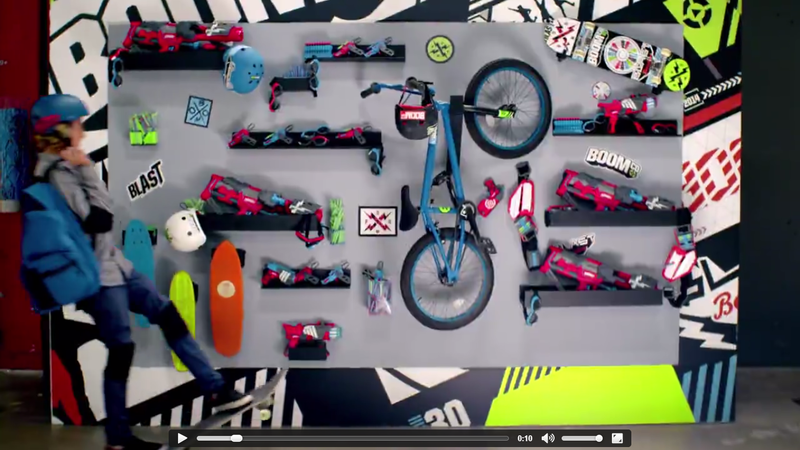 Mattel seems to be gearing their marketing toward teenage boys in particular, especially with the inclusion of several X-Games athletes in their campaign. It runs counter to the recent trend of marketing blasters towards girls, but perhaps that's a good thing. Mattel is simply focusing on a core demographic that Hasbro and others aren't (to be clear, they aren't being neglected - teenage boys are simply not the sole target of Hasbro's current endeavors). If Mattel gets enough market share, then perhaps we'll see girls' versions in the future. Along with our super serious actor, we have a great shot of the Rapid Madness, with a fully loaded clip and the front grip/air pump handle displayed. It is indeed full auto when pumped to capacity. Also, it seems tying your shoes is a legit defense strategy. Here's the Farshot, dart in barrel and ready to fire. Here's a GIF of the Clipfire. Easy enough to see the spring-powered plunger. This clip from the videos shows the Twisted Spinner in action. Pulling the lever all the way back launches the dart, then pushing it forward spins the turret 315° to the next dart. It's a purely cosmetic feature and is highly unnecessary, but it does look cool. While we're looking at the Twisted Spinner, let's look at its shield! These darts are designed to stick only to the material making up the plates/decals on the shields and targets. The detachable shield also pops out when you press the button on it. Take a look at this picture of darts sticking to the decal. Notice how shiny they are? 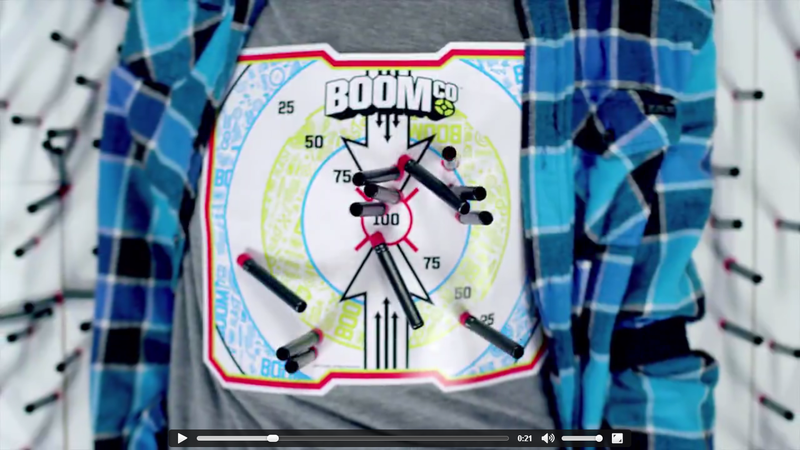 It's clear that these aren't your average foam darts in terms of composition. The blasters have dart pegs, so these are at least similar in shape to Elite streamlines. We have yet to discover the dimensions of these darts, so here's hoping they're 1/2" in diameter, for the sake of easier modding. At the end of the first video, we have the products being initially released. Blasters, bandolier, goggles, etc. One last GIF of interest! First, you see the clip advancement of the Rapid Madness. More importantly, watch the second half. That's the Stealth Ambush being used, which we know uses clips. 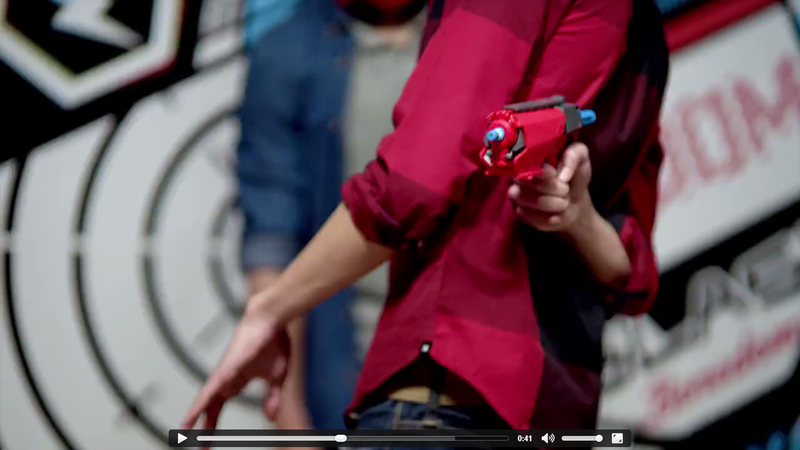 But by moving the rear hand grip forward, a blue plastic piece pops up, firing its own, separate plunger and dart. 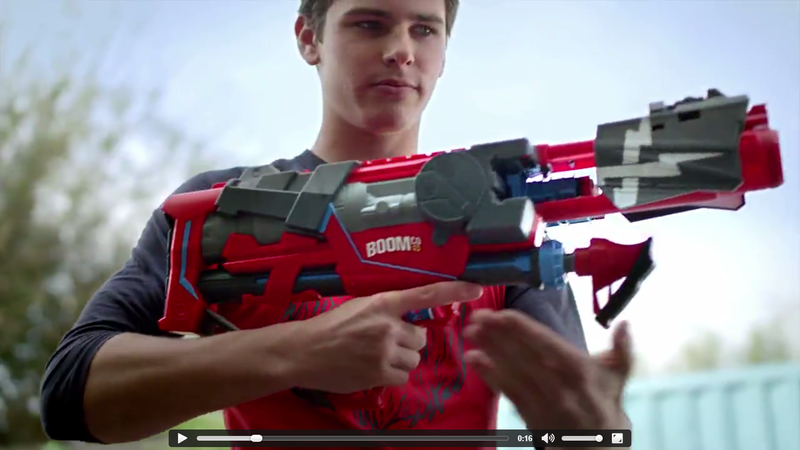 No clue if it's an emergency-type feature, or if it boasts the same 70' ranges as the blaster itself. If any more news gets released, I'll be sure to post it! The blog has a to an extraordinary degree restrain focus that opens up, shockingly into broad assortment of concerns. Trademarks Update: Lots from Buzz Bee! Lanard Total Crush - An Answer to Rebelle?